1854 Temple Parlor #4.Vose Co.,Albany,NY. Looks like a Victorian cottage, very ornate design and incredible castings. Fully restored. We also have the larger #5 for $2000, and the #6 for $2200. A fine example of an 1857 stove made by the Wrathbone Company in Albany, New York. Absolutely one of the nicest decorated early stoves. Totally ornate from top to bottom with swags, cartouches and a host of other intricate designs, complete with a great urn on top. Shown without door handle, but it does indeed come with it. With a pair of sliding doors on the front graced with a sea shell motif, this nice early wood parlor stove is a classic. Crisp details and architectural elements reflect the design elements of many early stoves. 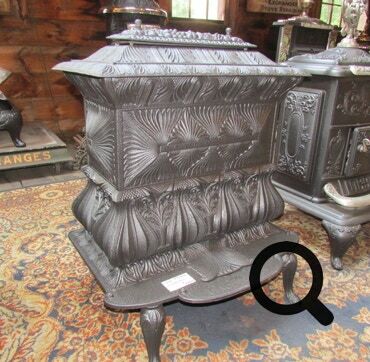 A perfect example of an ornate top of the liine early stove. Simply mint condition in classic black. Topped by a very ornate finial. Made in New York. Made by the Vose Co., Albany NY. Circa 1857. A smaller column stove, with bold, ornate castings. One of the last column stoves made. 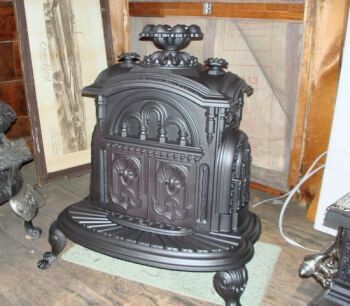 Here is an early 1844 great 2 column stove made by Ransom and Rathbone Co., Albany,NY. Crisp detail in the castings of garden urns and the paw feet. Mint Condition. Dimensions: 32W x 21D x 50 H.
French and Winslow parlor stove, Cincinnati,1845. Artistic, ornate design, large size. This beautiful Early Stove is not for use - it is for display purposes only. Dimensions: 30W x 36H x 24D.